Sony has announced the lineup of free PS Plus games for December 2018. 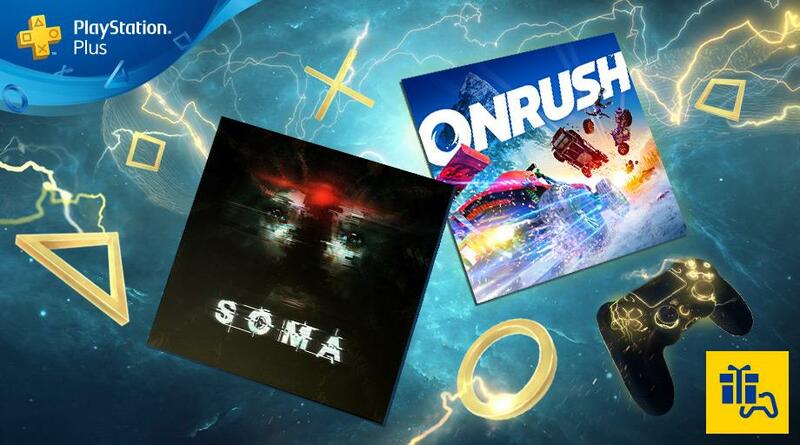 First up, PS Plus members on PS4 can download SOMA, a unique continuation of Frictional Games' signature style of explorative horror, provocative storytelling, and unfathomable tension, free of distractive cut-scenes and combat. The second free PS4 title is ONRUSH, promising adrenaline fuelled off-road arcade racing. It’s about speed, takedowns and teamwork with high-tempo thrills that focus on fun, excitement and the spectacular. On PS3, members can download Steredenn: Classic, a frenetic and chaotic space shooter, carved in big beautiful pixels, with insane boss battles. Embark in your ship and engage the fight against dreadful space pirates in a never-ending combat for your survival. And the second free PS3 title is SteinsGate, a time travel visual novel. For PS Vita, subscribers can download Iconoclasts, a side scrolling indie adventure, which is also cross-buy on PS4. The second free Vita game for members is Papers, Please. Your job as immigration inspector is to control the flow of people entering the Arstotzkan side of Grestin from Kolechia. Among the throngs of immigrants and visitors looking for work are hidden smugglers, spies, and terrorists.